Home » Brushes etc. » Have you washed your brushes today? Have you washed your brushes today? If you use makeup brushes on a daily basis, this is something that’s easy to forget to do. 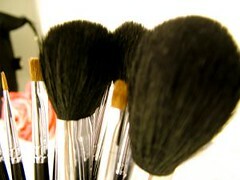 I use my fingers for eye shadow, but I use a powder brush or kabuki brush for applying loose powder. I also use a blush brush for my blushes and an eyeliner brush for applying gel eyeliners. Once a week or once a fortnight, I’ll gather up all my brushes and give them a good wash. There are some brush cleaners in the market if you look under companies like MAC and Shu Uemura. However, I use Johnson’s Baby Shampoo. Yep! The kind you use on your baby. Its formulated to be mild so babies can use it. And if its good enough for baby, its good enough for your brushes. Its also cheap. Wet your brushes. Then soap up your hands with the baby shampoo and gently swirl your brush in your palm. I usually twirl it in a circular motion or in an up and down motion. Do this until your brush head is saturated with the soap. Rinse by swirling in running water until water runs clear. Pat dry on a towel. Do not squeeze the bristles and shape the bristles back into the shape of the brush. Dry flat, not standing up. Its better for your brushes to lie flat as they dry so they don’t go out of shape. Do not dry in direct sunlight for this will shorten the life of your brushes. As I use mostly powder products, I can afford to wash my brushes less regularly. If you use a foundation brush or lip brush, make sure that you wash them often. At least 2-3 days for you don’t want the cream or liquid products to breed bacteria. Cleaning your brushes will make your makeup go on easier and better. You won’t have old colours messing up the colour you are applying. Its also good for your skin, for you don’t get a buildup of old oils and bacteria on your brushes. So, have you washed your brushes today? Doris: Tee hee… well with paid posts you can buy new ones!